Happy New Year from Warhammer Tau! If there's one resolution any Tau army should make, it's for more plasma and more railguns too. Since the seeing a lot of aggressive Tau armies at the Grand Tournament and building my Space Wolves army, it's clear to see how the Tau are being left behind in 5th edition due to their plethora of basic S5 guns and apparent lack of plasma gun, melta gun and lascannon equivalents. Missile pods are cool, but they're not going to be destroying any tanks in a hurry without a little bit of luck. 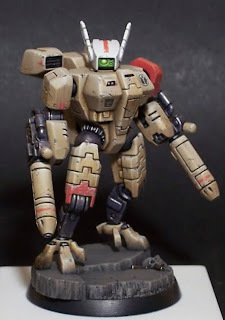 So as I ponder a return to the Tau ahead of schedule, my sights are set on fielding more Battlesuits than before and more Broadsides too. In particular, I will be arming my Broadsides with the Advanced Stabilisation System and twin linked plasma rifles. Why the sudden move towards plasma? Because I'm sick of outflanking space marines, deepstriking terminators and other nasty targets with a high armour save jumping straight down my throat. Let's see how they cope with a unit of 3 Broadsides putting out 6 twin linked plasma shots followed by a charge! Overall, this provides better anti-tank and harder hitting units. The loss of massed basic weapons fire isn't going to have too much of an impact, because it never seemed to actually kill much anyway due to the poor AP. Did you paint that Crisis Suit pictured in this post? That thing is amazing! I'm afraid not. I think it was a Spanish Golden Demon entry. But it could be my new colourscheme. I might see some problems against hordes, especially with the new 'Nids coming to town. Against power armoured guys your suggested list could work quite well but the bugs eat this kind of army in no time. I don't know about orks, but I guess it goes the same way. Generally I think you are going to be outmaneuvered by fast armies. And which army hasn't the potential to be fast nowadays? It's just my few cents, but I think your recent lists are more solid. But always depends on the environment you are playing in. For friendly games it's a nice change to the mech-lists. Are you building your new army yet? I am curious how that will turn out. Gredus: Would You please send me a link to your blog? I'm rather interested! I do agree that the missile pods need some help to KO armor, but I'd still like to have that capability in the army. Furthermore, it lets me start wounding infantry and even monstrous creatures at range. I'm also not sure I'd drop the missile pods from the Broadsides. In fairness, the only time the TL plasma rifle is actually preferable to the railgun is when there are heavily-armored infantry within rapid-fire range. I believe they can mount a single support system, but I'd not lose the Adv. Stab. Sys. in favor of a multi-tracker. And, of course, if there happen to be more numerous and not-so-durable infantry approaching, then the SMS is totally worth it. However, it all depends on how much you see in the way of marines. If that's all you see, then build to fight that, but if not...yeah. Your list has lost a good amount of volume of fire, and a chunk of mobility. Also, you've lost mobile cover for your battlesuits, which will be a pain if you ever face S8+ weaponry. Great to see more posts on Warhammer Tau. I've only got into reading 40k blogs in the last few months, and Warhammer Tau is one of the best. Firstly, good to see you have returned. I do fear that this new, essentially "gunline" list will cause you no end of hassles due in some part to the exposed Fire Warriors and in more part to the lack of Hammerhead sub-munition. Perhaps using the AFP on a Shas'vre and the CIB on your HQ to take advantage of the higher BS could provide you with some measure of deterrent against the likes of Orks, Guardsmen and the soon to be plentiful Nids. That said however the lack of mechanisation would, in my opinion, result in this list not being competitive in a tournament setting since those S8+ AP2- shots have to go somewhere if they are not going into your tanks and I have a feeling that your broadsides might be the destination. My Tau always struggled against marines. Well, they could take them out, but they'd be unable to advance. I think you're right about the suits being unprotected. But more Broadsides is definitely the way to go. Personally my lists usually max out firewarriors in devilfish, run a few broadsides and some hammerheads. No offense to your personal list building style, but i've always thought the way you run firewarriors in comparison to suits was a bit odd. If you get a chance, I think you should try maxed firewarrior squads in a smartfish, and possibly deathrains instead of fireknives. Sending 24-31 s5 shots at a marine squad will do some serious damage... plus it has the benefit of killing hordes too! I don't know, you may not want to give it a try, but if you do, let me know how it fares for you. slxiii, I have played mostly against marines and tried to use the fire warriors against them with no success at all. I mean I could take down 2 marines maximum and I was lucky then, the usual number was one. Next turn I got slaughtered. The commander I usually run is Cyclic Ion Blaster/plasma, so if needed he can kill off 3-4 marines in a turn as well. The thing about Tau is that they have to work as a perfectly oiled machine, or they will fail 9 times out of 10.... The 3 plasma crisis suit unit will not wipe out a unit of marines either, and it will probably be wiped out the next turn as well(assuming a few meltas are in his army).... so in either case the marines won't lose alot, and you'll be wiped. The advantage with the firewarriors is that they are cheaper, scoring, and more expendable, plus they have a contesting box called a devilfish that can tank shock as well... Plus the firewarriors WILL perform better against a horde.... all but 2 guys in an ork unit to 9 firewarriors is still a good trade. I think vehicles being so much tougher in 5th edition that the choice of how many railguns is very important. I currently run 5 in 1750, but I'm still considering going up to 6 by changing one of my hammerhead for 2 broadsides. However the hammerheads have some often forgotten benefits, and people only seem to look at the pts per railgun hit, and broadsides easily win that comparison. Hammerheads are still effecient after the enemy armour is destryoyed with a subminution round and 6 burst cannon shots. The hammerhead is safer from combat, it can move to only be hit on 6's, it can also move away faster than broadsides to avoid combat in the first place, and it can more up the field to contest objectives easier than broadsides. Hammerheads also soak up alot of heavy weapon fire that would be instant killing crisis suits and broadsides or popping devilfishs that are crucial to the Tau troop choices staying alive. 5th edition is also faster as well as more mech, and too many broadsides teams will make an army very succeptable to fast assult armies, it only takes any unit with a powerfist to take broadsides. I'd say balance out a team of burning eye's (for example) with a team of firestorms. Gives you a balanced army, by adding some high-armour hunters and some horde/transport hunters. I play against my friend, who plays Eldar alot. My tau army has a hard time dealing with his wraithlords. Do you have any advice to help me kill them? I usually ignore them and focus on the enemy transports to keep them away from you. But then, there's nothing that massed plasma rifle and missile pod fire can't take care of.